You want to save money when planning your wedding and still have decorations.Wedding columns create a focal point for your ceremony. Typically there are two wedding columns, one on either side of the ceremony aisle. 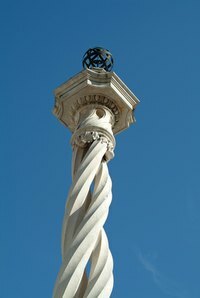 Real columns are made of wood, stone or iron. Renting columns for a wedding can be expensive too. So, design wedding columns using styrofoam or plastic foam sheets. They are available at craft stores.To build these two columns it will cost you between $40.00-$80.00 as of November 2010. There are other plastic foam shapes including balls or spheres to help enhance the look of your column. Use the serrated knife to saw both 12 by 36 by 2 sheets in half width wise. These four small sheets will be the tops and bases of columns. Place a base sheet on a flat surface. Glue four 12 by 36 by 1/2 sheets to the base along their 12 inch edges. Glue two of the 36 inch edges together, to form a 90-degree angle. Continue until you have four column walls. Wait 20 minutes to an hour for glue to dry. Place a hardcover book inside the column. This will give the column some weight and ensure the wind won't easily knock over the column. Cover your top piece edges with glue. Hold the glue gun at a 10-degree angle and gently push the trigger to release the glue. Keep a steady hand so your have glue evenly distributed along the edges. Secure it to the top of the column walls. Use the foam ball as an accent piece. Center the ball in the middle of the top and glue. Spray paint the columns with a stone texture spray paint. Insert silk flowers by their sharp stems around the balls. Drape lace or wrap ivy around columns for decoration. Do not leave burning candles near columns.